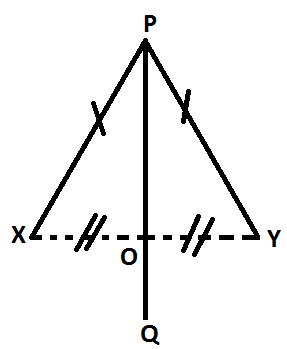 The locus of a point which is equidistant from two fixed points is the perpendicular bisector of the line segment joining the two fixed points. Let X and Y be two given fixed points. PQ is the path traced out by the moving point P such that each point on it is equidistant from X and Y. Therefore, PX = PY. To prove: PQ is the perpendicular bisector of the line segment XY. Construction: Join X to Y. Let PQ cut XY at O. Therefore, by the SSS criterion of congruency△PXO ≅ △PYO. Again ∠POX + ∠POY = 180° (Since, XOY is a straight line.